What’s the easiest way to tram the SO3? I have an XXL and some light sanding on the powdercoat didnt do much. Perhaps I need to go at it more. I still feel the screws somewhat bind while they’re going in. 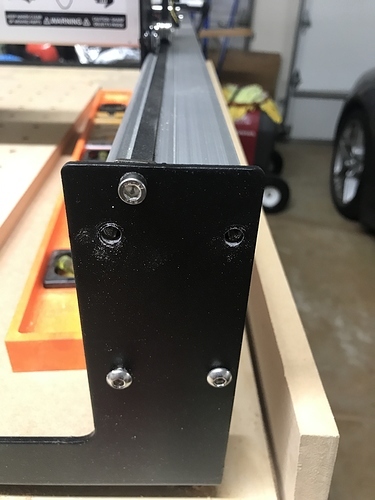 The rails are pretty tight in there and I almost feel like I would need to disassemble the thing to use my dremel on the steel with fear of damaging the extrusion. 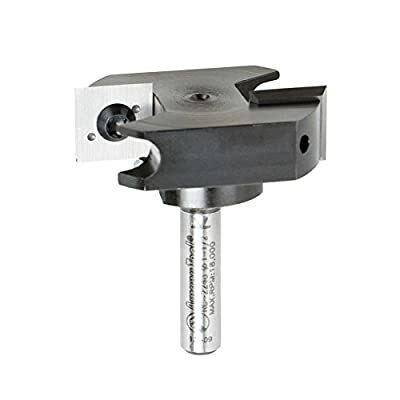 i would use the device you have to ensure the Spindle is square to the bed on the Z axis. Curious if anyone has used a granite surface plate to adjust the Spindle to eliminate the variance in MDF? 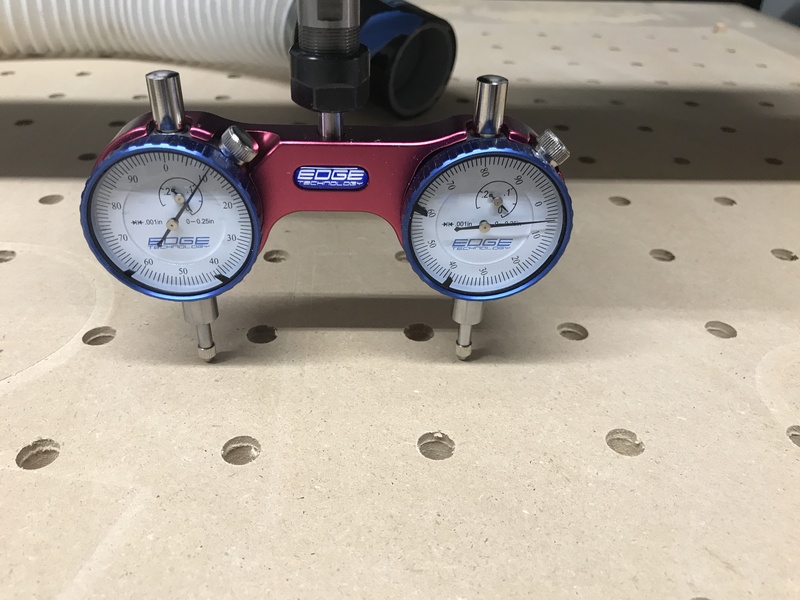 To check for the same distance across the bed on the X and Y axis, I would only compare readings from one gauge, determine where you need to adjust, then start adjusting one position at a time until you are within tolerance. When complete, tram the surface with a 1 1/4" bit, then check your readings again. I ended up drilling the holes on the right side. As you can see the alignment was a bit off even after drilling out the powder coat with a 6.5mm. After drilling, and some brute force, I got the two dials to read within .004 of each other. The best yet. I decided to throw my Amana rc-2248 fly cutter on there and secured a piece of scrap MDF on top. I was going to surface most of that board to see but without a dust boot, the fly cutter kicks a crazy amount of dust up and I had to abort. Holding a vacuum in front just didn’t cut it. I put the Pro Tram back on to find that now it’s within .0015 to .002! I’m fairly happy with the result now. By the way, the fly cutter is awesome and even though it’s MDF, it ate it like butter at 100 IPM and is a perfect cut. Freud looks like some quality bits. I have one of their 1/16 bits that I have yet to try. Was going to attempt die making for my wife. After drilling, and some brute force, I got the two dials to read within .004 of each other. As Craig said above, the dual-indicator tramming device you’re using is for adjusting the SPINDLE MOUNT/PLATE, not the X-axis beam. You got lucky because you were able to buy enough adjustment via the beam. What’s the proper way to adjust the beam then? Like for my case, the left side was cutting deeper than the right. I notice the eccentrics are set very different from each other, that can throw the whole spindle out of whack. You should be able to get the spindle square between those and small adjustments in the router mounting block. Adjusting the X beam is really only helpful for getting the far left of the bed to being the same distance from the wasteboard as the far right (ie. 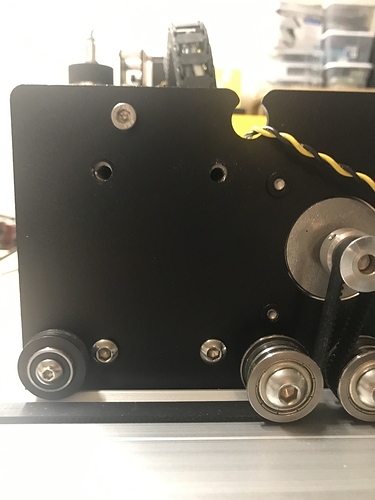 measure with an dial indicator at one end, traverse the spindle, then measure at the other end - that difference isn’t “tram,” it’s just out of squareness. Tram usually refers to just the spindle squareness against the cutting surface. Once you have the machine square, then you can align the spindle, but until then, you’re making something square against something that isn’t square across it’s surface. Thanks for the explanation! That makes a lot of sense. I do need to work on squaring the machine. It’s almost like a catch 22 with the mdf. Perhaps as a previous post suggested to use granite. Maybe glass? Mine has MDF, and I got it within 10 thousandths or so before surfacing the wasteboard. As long as it’s “close” - when you surface the board, it’ll be in as-good-as-its-likely-going-to-get parallelism to the rails. If you put something hard (like a granite tile) on top of the -surfaced- wasteboard, it’ll average out out-of-whackness caused by the out of tram in the spindle when you surfaced. 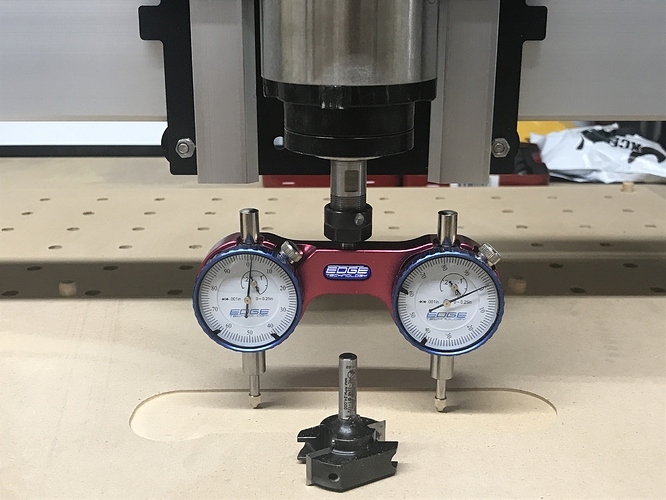 Now you can adjust the spindle, and go back and take off another few thousandths off the wasteboard to clean up the ridges from the out-of-tram spindle. I have trouble keeping mine that good, but have been able to pull it off for a special project here and there.